What's Happening With Shot Hole Borer? Education, outreach, and monitoring activities were robust during the cool damp winter months of 2018. Infestations continued to dominate Orange, San Diego, and Los Angeles counties, with lesser activity in Ventura and Santa Barbara counties. The need for funding of research, education, outreach, and waste management associated with ISHB was brought to the attention of state governance. Preventative efforts to increase awareness of ISHB in unaffected counties continued. Collaborative efforts of numerous agencies, educational institutions, and non-profit groups resulted in the successful efforts listed below. The two-day Invasive Species Summit was held in the State Capitol for legislators and their staff to learn about environmental pressures and costs created by these species statewide. Three pieces of proposed legislation were written either specific to or with components addressing ISHB. They are: AB 2054 (Gonzlez Fletcher), AB 2166 – California Farm Bill, AB 2470 (Grayson) – Invasive Species Council. The Statewide SHB Network convened telephonically to discuss ISHB, spread, threat, and help educate those in unaffected counties. An ISHB presentation was given at a statewide horticultural convention in northern California. 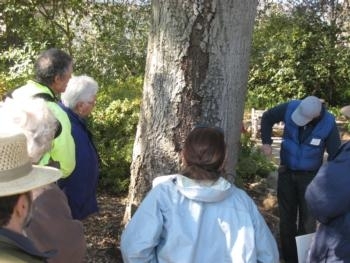 The triennial California Native Plant Society Conservation Conference was held near Los Angeles International Airport. ISHB was addressed at a pre-conference invasive species workshop, throughout the conference by tabling and poster session, and during the Invasive Species Session. UCCE San Diego helmed a two-part GSOB/ISHB-FD webinar, along with other UCCE and CALFIRE collaborators. The first installment streamed in March. UCCE San Diego began work on an online ISHB survey assessment tool that will be accessible when completed on PSHB.org. 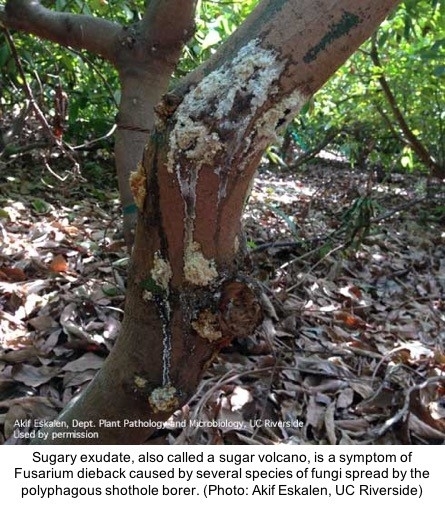 This feature will help the public determine if tree symptoms may be due to an ISHB infestation. An added component will allow UCCE to monitor reporting. The decision tree that is part of the assessment takes the reporter to part of the site whereby photos can be submitted if the tool determines a probability of ISHB infestation. This tool will be completed, tested, reviewed, and posted to the website by summer 2018. A. Raver. The tiny menace. Landscape Architecture Magazine. March 2018. Two closely related Ambrosia beetles (Euwallacea sp.) have been identified in commercial avocado groves in California. The polyphagous shot hole borer (PSHB), detected in Los Angeles, Orange counties and recently in Ventura county, and the Kuroshio shot hole borer (KSHB), detected in San Diego and recently in Orange and Santa Barbara counties, are morphologically indistinguishable, but genetically distinct. Already widespread in a variety of reproductive host trees common in the urban landscape (including box elder, willow, several maples, oak and sycamore species), the beetles represent a significant threat to trees in both landscape and agricultural settings. Adult females construct galleries in the xylem system of host trees, where they cultivate symbiotic fungi (Fusarium, Paracremonium and Graphium spp.) as a food source for their developing young. The fungi are taken up by progeny females in specialized organs within their mouthparts, and transported to other sites within the same tree, where new colonies are established, or to newly colonized hosts. The galleries compromise the structural integrity of infested trees, which can represent a serious safety hazard in urban environments, and disrupt the flow of water and essential nutrients within the xylem. In addition to the physical damage, the fungi extract nutrients from the xylem system, further depriving the tree of nutrients essential for healthy growth and fruit production. 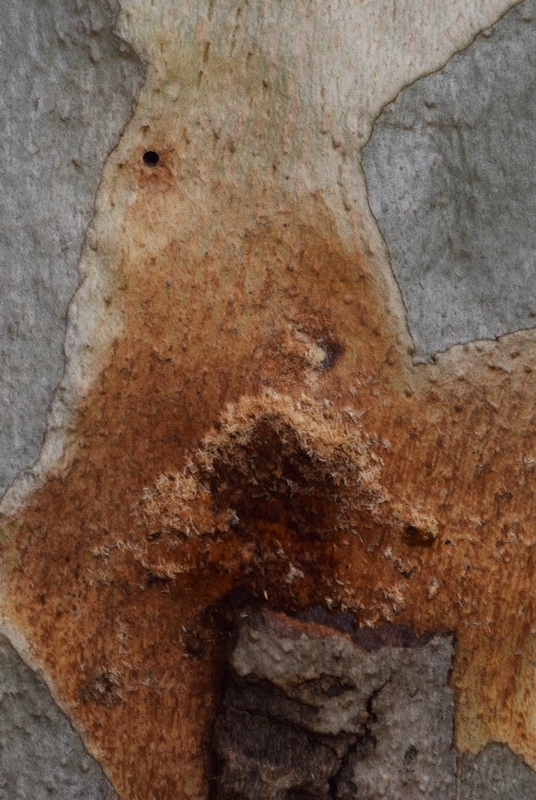 chemical pesticides is complicated because of their location inside the host trees. 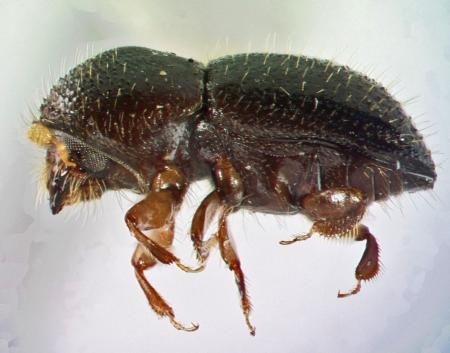 The application of insecticides to the external surfaces of trees, where the beetles must first alight prior to boring, has the potential to kill beetles by contact activity, and they may also have the potential to control emerging young adults before they can re-infest the trees. The drawback of surface treatments is that multiple applications are often required because of the relatively short duration of efficacy. 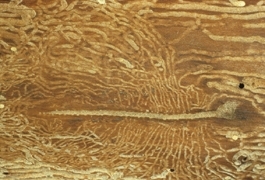 In addition, once the beetle burrows inside the tree, surface treatments are become ineffective. One possible solution to this problem may be the use of systemic pesticides, and scientists at UC Riverside are evaluating the use of both systemic insecticides and fungicides in a 2-pronged attack against the symbiotic system. Systemic pesticides are mobile within the xylem system of plants, and the fungicides could potentially target the fungi growing in the xylem and deprive the beetle larvae of a food source. The insecticides would prevent the beetle from establishing galleries within susceptible tree hosts, and prevent the survival of beetles and their offspring already present within trees. The big problem with systemic pesticides is getting sufficient concentrations of chemicals to the areas within the trees where the beetle and fungus occur. Although there are exceptions, most systemic treatments are administered to the soil for uptake through the roots. However, in mature avocado groves, the high organic matter content of the soil can prevent effective absorption by roots because the pesticide becomes bound to organic components within the soil. Trunk injection of pesticides directly into the vascular system of trees eliminates the potential for binding of pesticides within the soil, and increases the amount of active ingredient inside the tree available to impact the beetle/fungal system. Systemic pesticides must be formulated for trunk injection and so careful evaluation is needed to ensure optimal efficacy. Trials are being conducted with the assistance of avocado industry and grower collaborators in areas where the SHB has been recorded. 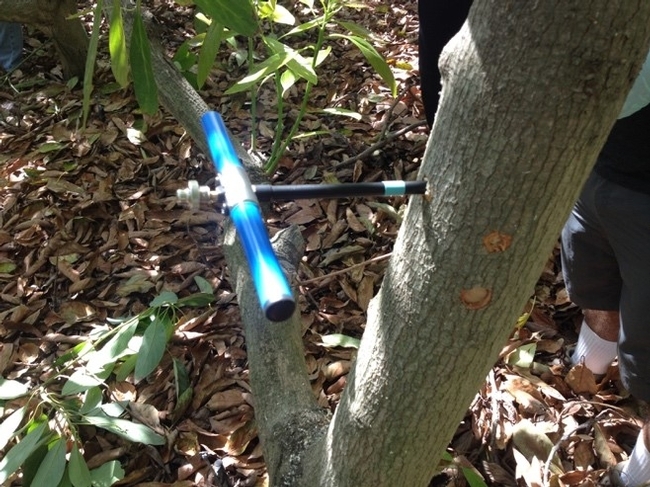 The chemicals are injected into the trees using commercially available equipment, and the movement of the active ingredients is then monitored over time in wood core samples taken at different heights of the trees. Two methods are being used to confirm the presence of the chemicals. Insecticides are being quantified using ELISAs that are specific for the active ingredients under investigation. Wood cores taken from trees treated with fungicides are placed in direct proximity to the fungal pathogens growing on agar plates to determine if growth of the fungus is inhibited.